The understencil wipe process begins with a roll of fibrous material that is used, as the name implies, for wiping across the underside of the stencil and removing soils. Usually, the stencil printing machine software provides the operator with a recipe of options for programming a specific wipe sequence. For example, a common sequence starts with a wet wipe of Cybersolv C8882. This is then followed by a vacuum wipe which attracts stray solder balls and removes trace levels of the previous wipe solvent into the wiper roll. Each step in the wiper sequence traverses back across the stencil in the opposite direction of the previous wiper sequence for maximum results. 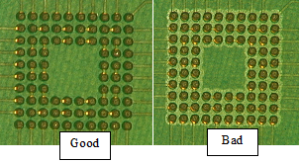 A critical requirement for best cleaning for the bottom side of the stencil is first to rapidly dissolve the flux component within the solder paste. This allows the solder spheres to be released. Then they can more easily be picked up with the wiping paper. This also allows for the flux stickiness and spread on the bottom side of the stencil to be effectively cleaned. If flux builds up on the bottom side of the stencil, it will bleed out and transfer to the next board printed. Eventually, this will actually bridge the solder pads, increasing your leakage risks when running your no-clean processes (Figure 1). On fine feature parts, you must remove this flux bleed to prevent it from bridging across the solder pads in this way. Cybersolv C8882 is an ideal wipe solvent that is non-toxic, is compatible with the stencil printer, rapidly dissolves a wide range of flux compositions and dries similar to IPA. The drying feature is a critical KYZEN stencil cleaning design factor. Cybersolv C8882 solvent dissolves the flux composition, which reduces the level of flux on the bottom side of the stencil. Cybersolv C8882 works well for both coated and non-coated stencils.